As a child I grew up with whatever my parents listened to. Eventually my dad got into The Commodores, Peaches and Herb, Village People, and Motown while I liked it it wasn't what I wanted to listen to. Eventually I found a Country Music station that I could almost hear and was turned onto Dolly, Barbara Mandrell, Conway Twitty, Willie Nelson and more. The songs spoke to me. They were life and Dolly's Here You Come Again was the first country album I ever purchased. It was interesting how Lauren took information, tidbits and biographical information about Dolly and put it into a book that feels like Dolly contributed to it while also serving as a fan written book full of Dolly's wisdom, quotes, personality, and life lessons making it totally relatable to the reader. I totally loved reading about Dolly's philosophy on life, marriage, relationships, success and family. 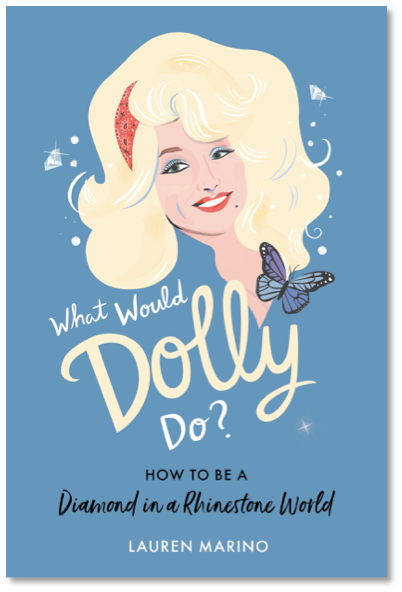 If you love Dolly, you will love this book.